This beautiful Caribbean style villa is constructed of volcanic rock and mahogany and sits on 3 acres of gardens with banana trees, palm trees, tropical flowers and the occasional vervet monkey. 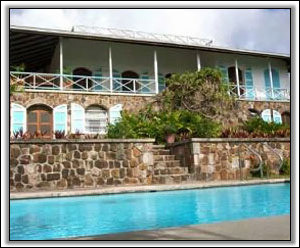 The very private "Frye House" has 4 bedrooms and 4 baths, a large rattan filled living room/dining room, ktchen/bar which all open onto a spectacular verandah for outside dining, relaxing and taking in the views of Montserrat, Antigua and the Atlantic Ocean. It is just a few steps down to the 20' x 30' pool. All the flora and fauna that make Nevis unique can be appreciated from this idyllic spot high on Nevis Peak. 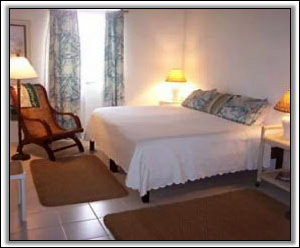 Frye House is great for families or as many as four couples that expect comfortable island living and a magical dream vacation. 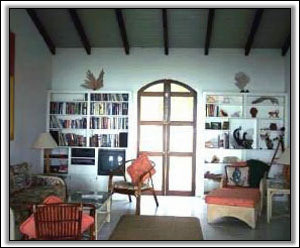 The Living Room, with comfortable rattan furniture with many spots for reading, conversation and watching TV. The Dining Room and Bar is off the wet bar and kitchen and has a large glass table which can seat eight comfortably. The bar is fully stocked. 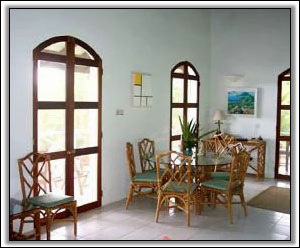 The Kitchen, which is very well equipped with coffee maker, Cuisinart and blender. The Master Suite, with king-sized bed, large dresser and mahogany closet, ensuite shower and bathroom with bidet. The Guest Suite, with 2 twin beds, end tables, ceiling fan, a large closet, and an ensuite shower and bath. 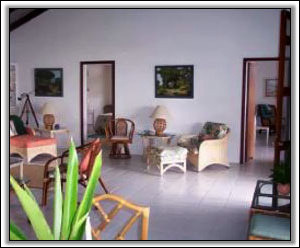 The Verandah, which surrounds two sides of the house with a 180 degree view of Nevis Peak and the ocean. The verandah always has a wonderful island breeze. There are three sitting areas and an outdoor mahogany dining table, which is suitable for eight people. 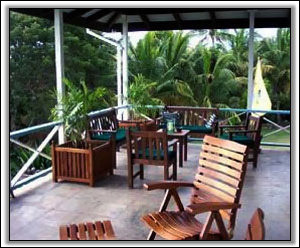 The verandah is perfect for enjoying the views at breakfast and dinner. Two bedroom suites, completely private from each other with their own separate entrances. 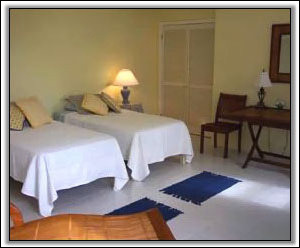 The Yellow suite has twin beds, ceiling fan, teak writing table, teak chaise lounge with very large ensuite bathroom. 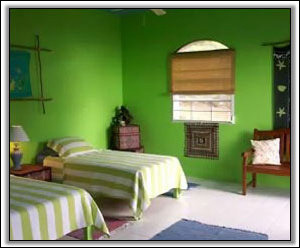 The Green suite is great for teenage kids. It has 2 twin beds, ceiling fan, teak twin sofa, and a large Indian chest. Amenities: CD Player, Radio/Stereo, Cable TV, VCR, Washer, Dryer, Telephone with Answering Machine.